Purpose: Use this document as a reference for reclassifying a position with a new job code in ctcLink. Important: Position data MUST be kept accurate and in sync with Job Code and Salary Admin Plans. It is important to modify the pages in proper order to keep the data in sync. Modify the position data first, and then the employee record. Note: Processes in the Job Data area are view only – no changes are made. Enter the Empl ID in the Search Criteria section. In the Work Location tab, make a note of the position number. Make note of the job code attached to the employee. Enter the position number noted from step 4 in the Position Number field. The Effective Date will default to today's date, change if necessary. 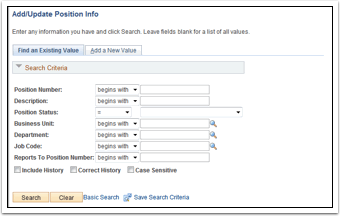 Click the Reason lookup icon and select JRC (Job Re-Classification). Click the Job Code lookup icon and select a new job code. Click the Reg/Temp drop-down menu and select the appropriate option. 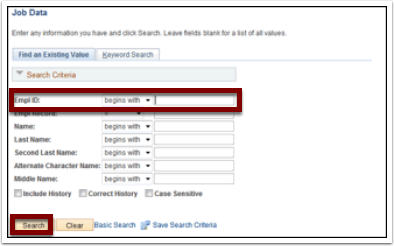 The Title and Short Titles fields will auto-populate based on the Job Code selected in step 12. 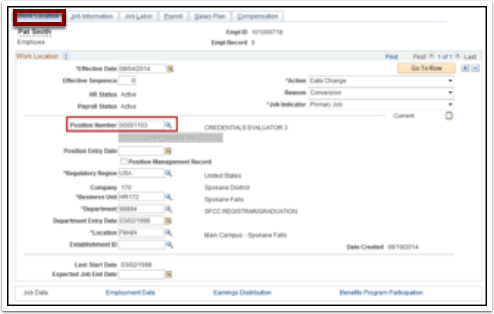 Note: make any other selections to field data as needed in the Work Location and Salary Plan Information Sections. Refer to QRG Copying and Creatings Positions. Enter the Max Head Count for the position, if necessary. Ensure the Update Incumbents checkbox is selected. Ensure the Budgeted Positions checkbox is selected. Click the OK button through the pop up message. Note: If the effective date is in the future, the incumbent position data will not be overridden until the future date. Click the Budgets and Incumbents tab. Click the Job Data link to go back to the current incumbent. Verify the Job Code has changed. Congratulations you have successfully re-classified a position!!! !